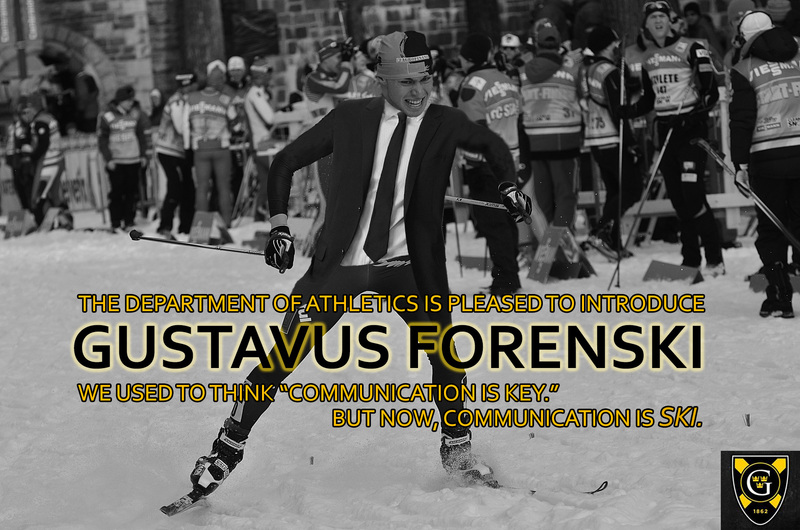 SAINT PETER— In an innovative cost saving measure, the college has merged the Forensics Team with the Nordic Ski Club, launching a new competitive activity that combines the complex oratory performances of speech and debate with the sport of cross country skiing. The newly-formed Nordic Forenski team will compete in 4 separate events combining components of both Nordic Skiing and Forensics competition. These events include Uphill Extemporaneous Speaking, Original Snow Prose, Lincoln Douglass Downhill Debate and Impromptu Budget Cut Preparation. The Athletic Department’s promotional Forenski poster. The Administration decided on this course of action after rejecting several other proposed mergers, including one between the ski club and the Center for Servant Leadership (CSL). This would-be new department, entitled the Ski-SL, would have provided career counseling and advising with the goal of having every student employed as a ski instructor within 6 months of graduating. To save additional costs, the college is seeking materials and equipment that will serve the purposes of both the oral argument and winter travel aspects of Forenski. These include harvesting the tears of fired tenure-track Communication Studies professors as ski wax and throat relief tea.